Journey To My First NPC Figure Competition! Nobody will believe you have potential, if you never put forth the energy to prove it! No sponsors are going to invest in you if you do not invest in yourself. Read on to learn about my journey from beginning to finish of competing and winning. It was my year to compete in figure. I had been talking about it for a while now and I thought I was ready to go! For many months prior to my destined competition, I just figured that I would build as much muscle as I could, and diet down to lose the body fat the same way that a bodybuilder would. Then I would combine makeup, a tan, beautiful competition suits (made by Cynthia James), and confidence to the mix and that would equal one beautiful figure competitor! Well, I was kind of right! Muscle size is important on your off-season. You have to remember that weeks of dieting can and indeed will shrink your muscles to some extent. However, I took the heavy lifting to an extreme! After completing pyramid workouts, and sets of 8 and 6 reps in the weight room for a few months, I had put on a lot of size. I even had decided not to watch my diet as carefully so that I could add on some size, and that is what killed me! I was the biggest and heaviest I had been in over 3 years! I took my 14 weeks out pictures and almost started crying. No wonder my jeans didn't fit! All of the sudden it didn't matter to me how much I was able to squat, or how heavy I could shoulder press, all that I wanted was to be able to see my abs again! It was time to begin dieting. I went by a classic bodybuilding cutting diet, eliminating all dairy and modifying my carbohydrate intake. I ate 5-6 times each day. After the first week, I felt like I had already made a complete 180! Thank the Lord. I had spent quite a bit of cash on competition suits, supplements, and gym memberships. I still wanted further assistance in my training and diet, because I knew this could be a big year for me if I had a plan for the next 12 weeks. I met with a very close friend of mine who had successfully competed in bodybuilding, and she promised to help me with my diet and posing, starting from 12 weeks out. The plan she came up with was very basic, but proven to work. I started dieting, however I didn't go extreme, small and gradual changes would keep my body changing and decrease the chance of plateau. It was also time to quit "socializing" on the weekends, and get more sleep and cut out those extra "carbs!" My goal for the Emerald Cup was much more important to me than staying out late with friends. Sleep = recovery, muscle growth, and fat loss. And the only extra "liquids" I would be drinking would be water! Another step was cutting out late-night snacking or even late-night dinner! Often 9pm was the only time for me to eat before I started planning ahead and bringing meals with me out to the track while I coach. This takes planning and time, since proper nutrition isn't always found in Meal Replacement Shakes or protein bars, contrary to popular belief! Remember, those items are pre-packaged with an expiration date, and the goal is to eat as fresh and clean as possible. The first step was to complete more cardio sessions. Between work and coaching, I was doing less cardio each week it seemed, and more lifting. It was time to modify my weights and get in more cardio. The next step was changing my weights to a few more repetitions, especially in my leg exercises, with less rest time between sets. I was also trying to create more of a mind-to-muscle connection, where I could feel each muscle working appropriately during each exercise, to stimulate symmetrical hypertrophy and flexion. This would facilitate my onstage posing and being able to "feel" without being able to see my reflection. The same went for my workouts. I started training with a few higher reps each couple of weeks, I didn't go extreme, just small and gradual changes would keep my body changing and developing, while decreasing chance of plateau. At 13 wks, I was completing pyramid workouts and reps that were usually around 8, even for my lower body! So, beginning at week 12, I started sets of 10 and still a few of 8. I wanted to maintain my size for a while; I didn't want all the hard-earned muscle to just catabolize with an increase in cardio. I know my body, if I up my reps too soon, I'll wither away to nothing. I started to read everything I could find about fitness/figure competitions and diets. There was one problem. Everyone will tell you what works best for them. But I am not them, I am me. I knew I would have to take in the majority and try what the pros do; however, I kept in mind what has always worked for me. I used to stay very lean year-round, but this year I wanted to gain some size, so I had more fat to lose this time. This is where it became very important for me to write down everything that I was doing (diet and workout), and how I felt while doing it. I did have one question, where do you take all of the information being thrown out at you, and how do you know whose opinion is best? My attitude definitely needed to change as well, before I could step up on stage nearly naked! I thought I knew what I was getting into. Competition dieting and training is definitely not easy. It takes planning, dedication, and money. Competitors must always be 100 percent focused on their goals, or the drama of everyday life can easily affect one's mentality and determination. I knew confidence would come naturally, the leaner I became. But first things first! I needed to learn the mandatory poses and quarter-turns, so I didn't lose points in that department! You have to believe that you look the best on the stage. Judges are able to see any self-doubt that you have. I purchased a DVD offered by Repetrope, "What are the judges looking for in figure/fitness?" This helped a lot, but most of my advice was provided from a competitor at my gym, and also from Cynthia James (CJ-Unique Physiques). Make sure you are getting advice from people you trust 100 percent! Many refer to me as a supplement junky; however, when you are cutting fruits, dairy, fats, and calories from your diet for an extended period of time, you will need extra supplemental support. Yes, my supplement list is long, but remember, it is not like this year-round. The goal for 12-8 weeks out was to get my body ready, eat at the same times everyday, learn the routine of cooking, eating, sleeping, and make time for some cardio sessions. I decided that 5-6 meals throughout the day (3 hours apart) would be sufficient for me. I wasn't concerned with measuring and weighting food yet, but my calories ranged between 1700-2000. I kept a food journal, so I could reflect back later in my dieting, or for future competition planning. All of my meals were to be high in protein, and all carbohydrates were to be complex or fibrous, I limited my cheat meals 1-2X week-in the beginning stages of my dieting. The diet gets a little more strict now, I started to decrease condiments, especially high sodium ones, and make sure I never missed any meals. I cut out fatty fish and red meat. I still allowed myself 1 cheat meal weekly to keep my metabolism guessing, and give me something to look forward to after a long and hard week of training. I had a great posing practice at 8 weeks out and believe that if I commit early I can take my physique to the next level. Haven't lost any strength at this point, but I can tell that I am cutting the fat from the diet because I have a difficult time focusing at times. These few weeks were the hardest for me. It is hard to think and rationalize when you're on such a low-fat diet. I decided to try MCT oils for extra energy. It worked I think, I regained my sanity after using it for a few days. This is where the diet gets rough! Now I am cutting out my ketchup and fat-free dressings (because of sodium and sugar) Nuts are gone! I am decreasing the portion sizes of my meats (except my post-workout meal), and decreasing carbohydrate portions as well. Started taking Syntrax Subdue in the evenings because I am getting very hungry later at night and wake up during the night starving! Up the intensity and include sprinting into the workouts, include the stair-climber for a change. I am still getting leaner, so I am not going to increase the amount of time that the cardio sessions take. Cardio sessions have been getting more difficult even though the intensity levels on the machines have not changed, it is frustrating! Start posing 2 times weekly and hold each pose for longer. Try to incorporate posing without the mirror, this was comical. No food after evening meal - EVER! No liquids except water, this will be difficult, but I feel I will have a better skin tone if I eliminate diet sodas and Crystal Light and stick to plain water! There won't be much change in the meal plan now. I am adjusting my shoulder workouts now, to a little heavier routine than what I have had for the past couple of weeks. This is because I have really long arms, so once my reps get higher, I tend to shrink up and lose the roundness in my shoulders. I want to keep my fullness up top, but I am still adding in supersets and drop sets to continue to develop definition. I am really concentrating on working each sides of my body equally, to maintain a symmetrical appearance. Posing is a priority now, and I know I should be practicing everyday; however, I have been getting in 3-4 practices each week. The leaner you become, the easier posing is because you do not have to flex as hard to see striations and definition. 6 Cardio Sessions: 50-60 min, 30 min, 40 min, 60 min, 30 min, and 30-40 min. On the longer cardio session days, I do half of the session prior-to the weight workout, and the other half afterward. Bodybuilding.com fitness expo on Friday the 15th! This is a great opportunity for me to practice my plan for the competition week. At this stage in the diet, I am only at 1200-1400 calories from here on out. I decided to cut out ALL seasonings! No Mrs. Dash! My new best friend is Balsamic Vinegar! I am doing low/no carb for 3 days with water flood, and then increase carbs a little each day for the last 3 days with a water deplete and Taraxatone - a diuretic. This is my test run for the Emerald Cup. I painted on M/T/W/TH/ and touch-ups on Friday AM. Practice-practice-practice posing! Wednesday - 25 gr. Carbs w/each meal. Cut water to 1 gallon. Thursday - 50 grams carbs w/each meal. Cut water to 3/4 gallon. Friday - 50-70 carbs w/each meal-this is the day to add some salt! Time to eat foods that I haven't had in forever! Cut water to 1/2 gallon or less. These workouts are HARD! Not only do you have zero carbs in your body for energy, you are already depleted somewhat, and there is little or no recovery between sets. Remember that it will only be a few days of this routine, and the hard work will pay off! Friday - Pump up 30 minutes before, and compete! Abs, standing calves, DB shoulder front/lateral/rear raises, push-ups, bench dips for triceps, DB row. Make each muscle group get a slight burn, you'll know they are pumped. Hopefully some veins will begin to show! Click Here For A Printable Log Of This Full Body Workout. My husband and I started my paint-on tan Monday evening. First, I soaked in a bubble bath for 15 minutes to make my skin look wrinkly, then I showered off and exfoliated very well with a loofah, washed my hair, and shaved well. I then rinsed off in cold water and dried off. I washed my hair at night, so that in the mornings I could simply rinse off the excess paint in the shower without being in there too long. The next few days I'll wash my hair in the bathtub so my body won't be wet for so long. I want to be dark! Anyway, it was time to paint! I painted the front, and my husband did the back. My blow dryer sped up this process dramatically! It was obvious where dry skin was still on me. I had to rub the skin and paint off, and repaint these areas. This is why you start far enough out! I repeated this Tues/Wed/Thurs. nights, and did touch-ups on Friday AM. So did my plan work? I would have to say - YES! I won the Bodybuilding.com expo! This was very exciting for me, and was totally refreshing to hit the workout and diet hard for the last two weeks. I discussed my condition with the judges after the competition, and I was very proud of myself because they were all impressed by my symmetry, condition, skin tone, and suit selection. My quarter turns were the only thing I needed to focus on now for the Emerald Cup. Posing and transitions can always be better! Learning your poses without a mirror and holding each one for long periods of time will just make you even more shredded and toned. This was key for me to focus on for the next couple of weeks. I will follow the same workout and diet plan for the Emerald Cup, since I know it won't blow up in my face! I recommend to any competitor, practicing your carb deplete/load along with your competition week workouts, sometime prior to your first competition. Post-competition recovery (drink a lot of water) and re-focus for the big competition! I felt a little water-retentive on Saturday, Sunday, and Monday, as a result of the diuretic and water drop from competition. I don't want to play too many games with my body since this is my first competition I am not sure how my body will respond to everything. I was very relieved to have a competition under my belt and a win! I now know what to expect for the Emerald cup, except I won't be a beginner at it. My tan will be better, my carb deplete/load and water load/deplete will be better, makeup will be better, body condition will be better, and poses will be better! My plan in the weight room is to work each muscle group hard with a combination of heavy, moderate, and light weights. I will include supersets, drop-sets, burn-outs, etc. Of course I will be focusing on my weak points, as well as my calves, and abs! I also purchased new shoes for stage, to look more polished, and my others were a bit stretched out from the posing practices. Note-toes hanging over the front of your shoes is not attractive! I increased my cardio to 60 min, 45 min, 60 min, 45 min, and I took Friday completely off. Put the time in now, because competition week you don't do much after your carb deplete! From The Hardfitness.com Photo Shoot. I have learned so much about my body and mentality throughout the journey of dieting and training with a specific goal in mind. There are many things that I know I will do a little differently for my next competition. It takes time to learn what foods work for your diet personally. It is very satisfying and fulfilling to have competed in such a sport! Nobody will believe you have potential, if you never put forth the energy to prove it! No sponsors are going to invest in you if you do not invest in yourself. Keep reminding yourself why you decided to do this, what are your short-term goals, and what are your goals for the future? Some people enter contests for fulfillment after a dramatic body composition transformation, others are there to win! You must have goals or you won't have direction or motivation. Of course you will be skeptical your first show, and will want someone to do the dirty work of coming up with your training and nutrition; however, you can never rely on others to do your research for you. You are YOU, and only you know how your body will respond. If something works for one person, it may not work for you. Go back through your old training logs, look at old pictures of yourself when you had great calves, or had great quads; and read what you were doing then. Good luck! Be confident and remember to smile! Be proud of yourself for all the hard work and dedication you have put into this! I can tell you I am not going to rebound and gain a bunch of weight after my show! I do plan to be leaner for my future competitions - who doesn't?! 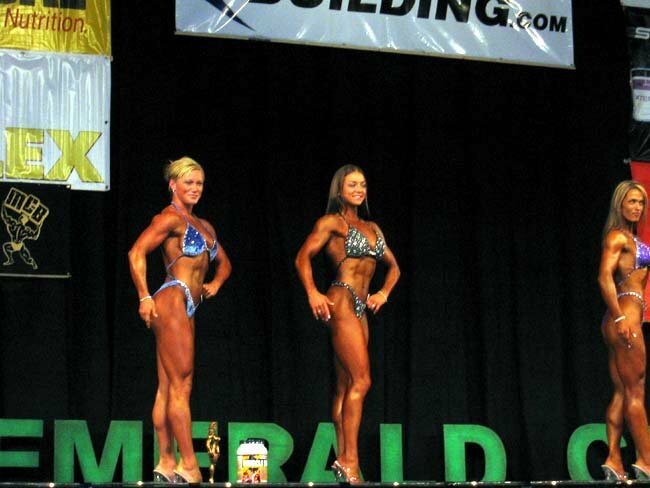 But for a starting point, I feel that I did very well, and was lean enough for my first show! It also will be beneficial to know exactly what my mentality is like at each stage in the diet. And supposedly, the diet is hardest the first time you do it. We'll see about that! However, I don't plan to stray too far from the clean diet anymore. I hope I'll never have to diet for longer than 8-10 weeks again. I plan to focus on symmetry - I'll definitely be working to make my left side match my right! I guess everyone has one side smaller than the other when they begin competing, but not for long! It is strange how obvious it becomes once you lose a lot of bodyfat! I'll be updating you all with my progress, at the Monica Brant in July! That is next on my competition schedule! I will be practicing my quarter-turns more and more and more, so that they are flawless. Watch out girls!